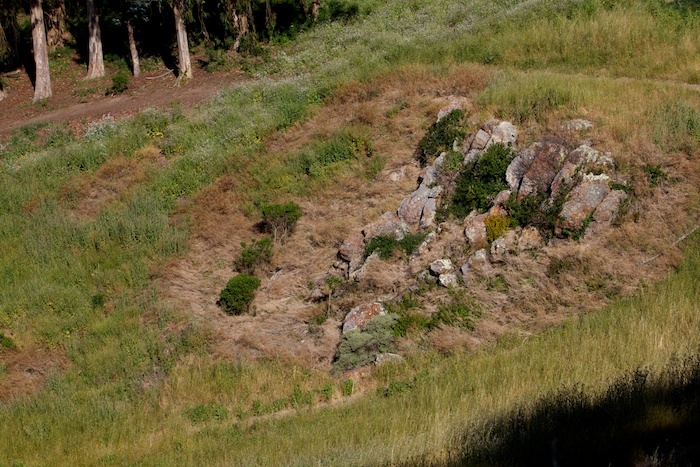 Some time back, we’d posted an article about the puzzling brown spot in Glen Canyon Park, around a rock near a trail. It looked like herbicide use, but regular visitors to the park hadn’t seen the signs SF Rec and Park must post before spraying herbicides. 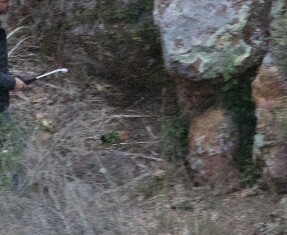 Also, as the picture below shows, it was close to a trail. Both the Natural Areas Program and the Department of the Environment had said there would be no spraying for 15 feet on either side of a trail. We asked them what was going on, and got no answer. 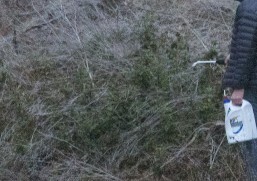 A “volunteer” was spotted spraying the area early one morning.We’d heard anecdotal reports, but this time, an actual incident was reported to us with evidence of unsupervised use of unapproved products without warning notices, and without public records, in a place where pesticides are not supposed to be sprayed. These pictures show the pesticide being used in precisely the area we were concerned about. So in addition to the recorded herbicide use by the Natural Areas Program, there’s unrecorded and unquantified toxins being used in Glen Canyon by sympathizers. It is not on the Department of the Environment’s approved list of pesticides for use on city-owned properties. 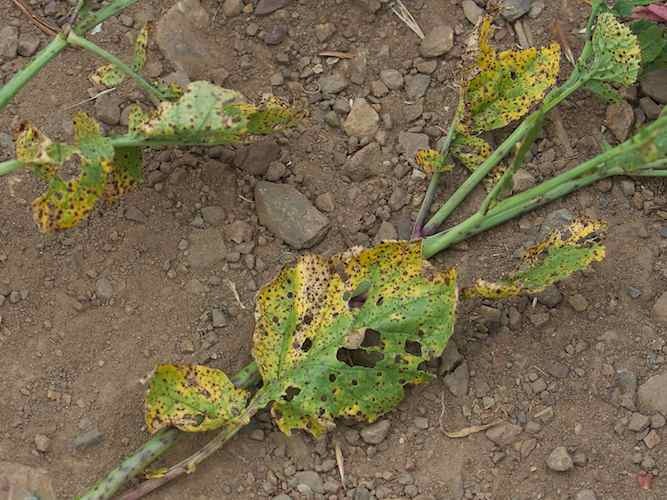 WHAT IS ROUNDUP READY-TO-USE PLUS? About pelargonic acid, the Material Safety Data Sheet (linked here as a PDF) says “Potential for mobility in soil is very high.” This means it doesn’t stay where it’s sprayed. It moves around.It also says it is slightly toxic to marine organisms – fish and amphibians. Besides glyphosate and pelargonic acid, Roundup Ready-to-Use Plus contains “other ingredients” that the manufacturer, Monsanto, does not (and is not required to) reveal. HOW MUCH TOXIN IN GLEN CANYON? This makes it clear that no one actually knows how much (or what) pesticides are being sprayed in Glen Canyon. The Natural Areas Program (NAP) sprayed this park at least 6 times in 2011. Clearly, sympathizers are also spraying it with unapproved products not safe for pets and wildlife, without posting warning notices, and without keeping any public records. It’s likely that they are spraying even more frequently than the NAP – which is apparently turning a blind eye to the problem. The NAP is based on community “stewardship.” Evidently, this has encouraged its “volunteers” take matters into their own hands and work unsupervised in ways that threaten our environment. typical behavior from these folks. they are a cult and determined to do whatever they want, no matter the cost to public health. and they are destroying trees in times of climate change? pretty bad policy. this is so heart breaking! Of course this would be an excellent method of avoiding legal action, if you can blame it all on volunteers as opposed to employees! next time someone should get a picture (and if possible name) of the sprayer. it’s against the law to destroy park property. Webmaster: We’re trying to get action on this. We’re concerned that it might not be an isolated instance.